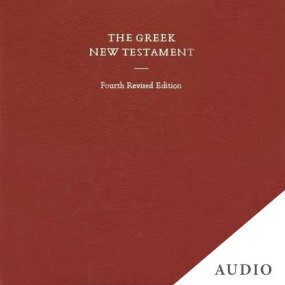 The Greek New Testament, 4th Revised Edition, also called the UBS-4, is a scholarly edition of the Greek New Testament aimed at pastors, translators, and students. Olive Tree is proud to present to you this audio version, narrated by John Schwandt using the American Erasmian pronunciation. This audio version is indispensable if you have ever struggled with transliterations or have a desire to increase your fluency and comprehension. Allow auditory learning to be a powerful reinforcement to your study process, immersing you in the Koine Greek beyond what reading alone can do. John D. Schwandt was a professor at New Saint Andrews College. He earned his doctorate in Bible translation at Gordon-Conwell Theological Seminary in Massachusetts, his master of arts from Westminster Theological Seminary in California. Schwandt was the general editor of the English-Greek Reverse Interlinear New Testament: English Standard Version (Crossway Books, 2006).